Where next to combat my ignorance about the Middle East? Here. We Americans fear and loathe Arabs in general but we imagine Saudis to be our friends. 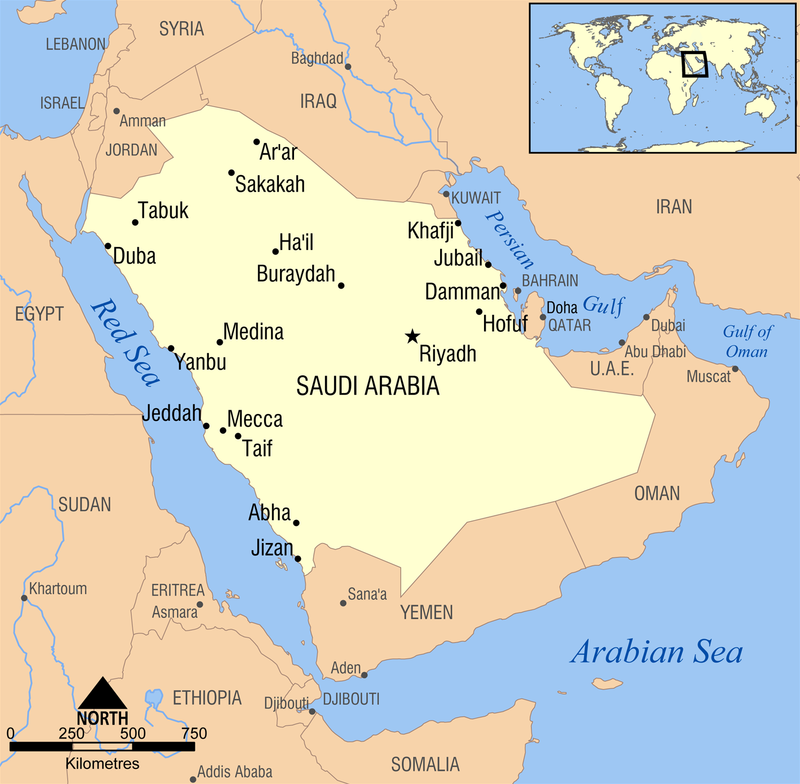 Saudi Arabia is mostly inhospitable desert that covers 80% of the Arabian Peninsula. The prophet Muhammed united nomadic tribes here in the early 7th century and established an Islamic state that his followers rapidly expanded. The center of the Muslim world soon moved to better lands and most of what is now Saudi Arabia reverted to tribal rule. In the 16th century, Ottoman rulers of Turkey north of Iraq added the Red Sea, the Persian Gulf and the Arabian Peninsula to their empire. Their control of the area varied over the next four centuries. In 1916, tribal leaders encouraged by Britain mounted a failed revolt then the Ottoman Empire collapsed at the end of WW I. Ibn Saud, who founded today’s Saudi Arabia and avoided the revolt, continued his three decades long campaign against his regional rivals. He established the kingdom of Saudi Arabia in 1932 as an absolute monarchy governed under a puritanical form of Sunni Islam known as Wahhabi that is practiced by 85–90% of Saudis. The other 10-15%, who face systematic discrimination, are Shi’a. No faith other than Islam is permitted, conversion by Muslims to other religions is outlawed and so is proselytizing by non-Muslims. The royal family controls all the kingdom’s important posts. Around 200 of more than 7,000 princes occupy the key ministries and regional governorships. The country in effect belongs to the Ibn Saud family. Saudi Arabia is bordered by Jordan and Iraq to the north with Egypt, Israel and Palestine to Jordan’s west. Syria is in the northwest and Iran is a few miles east over the Persian Gulf. These borders were drawn up by the British and French at the end of WW I with little regard for tribal, religious or ethnic realities. Saudi Arabia is interesting to two communities. Mecca, the birthplace of Muhammed and the site of his first revelation of the Quran, is Islam’s holiest city. Non-Muslims are prohibited from it and a pilgrimage to it is mandatory for Muslims. 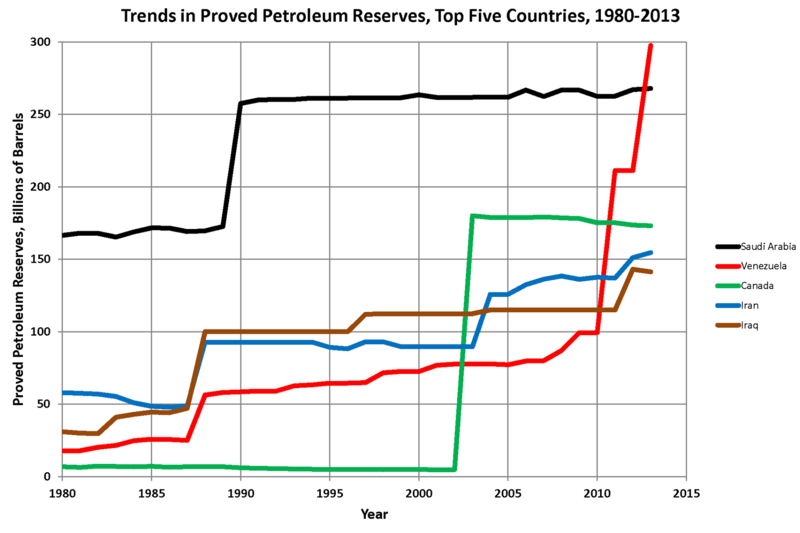 That Saudi Arabia is the world’s dominant oil producer and exporter and has the world’s second largest proved petroleum reserves motivates our interest. Oil was struck in Pennsylvania in 1859, Russia found it in the Caucasus in 1873, then the British found it in Iraq in 1903. They promptly declared they would “regard the establishment of a naval base or a fortified port in the Persian Gulf by any other power as a very grave menace to British interests, and we should certainly resist it with all the means at our disposal.” Five years later, they struck oil in Iran. Three years after that, the British began converting their navy from coal, of which they had ample supplies, to oil, of which they had none. They landed forces in Iraq in 1914, captured Baghdad and began projecting power from there. More oil was found in the Persian Gulf, starting in Bahrain in 1931 and followed by Kuwait and Qatar. Then in 1933, Americans found oil in Saudi Arabia. American businessmen were cautiously welcomed by the Saudi king as less threatening than Britain or other colonial powers. He negotiated well with Aramco executives, the business established to export the oil, and later with the US government, trading oil for infrastructure development that transformed Saudi Arabia in a very short time from a medieval fiefdom to a 20th century one that became leader of the petroleum exporters, OPEC. Saudi Arabia gained control of 20% of Aramco in 1972, full control in 1980 and was by 1976 the largest oil producer in the world. In 1973, Saudi Arabia led an oil boycott against Western countries that supported Israel in its war against Egypt and Syria. The Islamic revolution in Iran in 1979 led Saudi Arabia’s king to fear rebellion by the Shi’a minority in the east where the oil is located, and in the same year protesters against laxity and corruption in his government seized the Grand Mosque in Mecca. These events led to enforcement of much stricter religious observance and a greater role in government for Muslim legal scholars. The royal family’s relations had been primarily with Aramco leaders until the reign of King Khalid starting in 1975. After 1975 was when Saudi and US foreign policy grew closely aligned. Saudi Arabia provided $25B to Iraq in its 1980-88 war against Iran, which we supported. It condemned Iraq’s 1990 invasion of Kuwait and allowed US and coalition troops to be stationed in Saudi Arabia. But it did not support or participate in the 2003 US-led invasion of Iraq. The US by then no longer seemed a dependable ally. There is significant opposition in Saudi Arabia both to US influence, and to the absolute monarchy. The strongest opposition comes from Sunni religious leaders who want a stricter form of Islamic rule. Others want the opposite. The Saudi government was rated the 5th most authoritarian government out of 167 in 2012. Women have almost no rights, it’s the only country in the world that bans them from driving. There is also opposition from the Shi’a minority as well as tribal and regional opponents. The Saudi royal family’s greatest fear, however, until the recent rise of the Islamic State whose stated goal is leadership of an Islamic world, has been Iran’s growing influence. They are more alarmed now the US and Iran seem to be inching closer to a rapprochement. So the Saudi royal family needs US military support but is at odds with us among other reasons because, like every other nation in the Middle East, they opposed the creation of Israel and are supportive of the Palestinians. They have condemned the Hezbollah militants in Lebanon, but the Saudi royal family is Sunni and Hezbollah are Shi’a. Very recently, the king criminalized “participating in hostilities outside the kingdom” fearing that Saudis taking part in Syria’s civil war will return knowing how to overthrow a monarchy. Syria now defines terrorism as “calling for atheist thought in any form, or calling into question the fundamentals of the Islamic religion on which this country is based.” One of the groups they have named as a terrorist organization is the Muslim Brotherhood. Fear of its neighbors motivates Saudi Arabia to spend more than 10% of its GDP on its military, among the highest percentage of military expenditure in the world. The kingdom has a long standing military relationship with Pakistan. Some believe it funded Pakistan’s nuclear weapons program and could purchase such weapons from them for itself. A good representative of what the Saudi government fears is Safar al-Hawali, a scholar who was a leader of the 1991 movement opposing the presence of US troops on the Arabian peninsula and a leader of a 1993 group that was the first to openly challenge the monarchy. No surprise that al-Hawali is also a critic of the US government. We imagine Saudi Arabia is our friend, but our thirst for oil provokes their memories of colonial powers. Saudis and others in the Middle East don’t understand our unquestioning support for Israel. Their Muslim leaders are as suspicious of American Christians as we are of them. Inside Saudi Arabia the Shi’a minority is oppressed by their Sunni rulers, Wahhabi fundamentalists battle progressives, and nobody except the royal family can have a role in government. Preconceptions like the ones we and Saudis hold about each other are not a dependable basis for friendship. Instead, they fuel hatred. President Obama is about to visit Saudi Arabia to meet its new and reportedly dementia-afflicted 79-year-old king who is expected to continue his just deceased 90 year-old brother’s policies which include jailing a woman for nine days because she drove a car, public beheadings, stoning women to death for adultery and amputating thieves’ hands. Saudi Arabia is our ally against the “Islamic State (IS)”. But the appalling punishments our media presents as an IS abomination are actually a feature of Wahhabism, the extreme form of Sunni Islam that is the basis for the laws of both IS and Saudi Arabia. IS is an ultra-radical corrective movement to the Wahhabism used by the al-Saud monarchy to support their absolute power in Saudi Arabia. IS considers the al-Saud regime to be corrupt.